There are few things more serene than sitting and watching a storm roll in (from a place of safety and comfort and warmth). But Mike Olbinski doesn't wait for the storms to roll over his porch, he hunts the storms and films them. 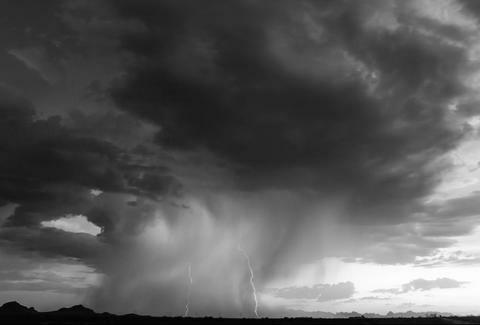 For his latest video, he swapped color for black and white and compiled a handful of storms he's recently filmed. It's a stunning time-lapse view of developing storms rolling across the American plains. "For quite a few years now I've been wanting to do something different with my time-lapse films," Olbinski says. "I love color. Storms are full of color. The blues, the greens, the warm oranges, and reds at sunset. The colors are sometimes what make a simple storm into something extra special. "But black and white speaks to my soul. I love it. There is something when you remove the color that lets you truly see the textures, movement, and emotion of a storm." Watch the storms develop in the video above. It may not have the ratcheted up drama of Twister, but it also doesn't have that ridiculous scene where Helen Hunt and Bill Paxton use belts to not get sucked up into a tornado.